I have a deep love for anything Oreos. I was the kid who would trade just about anything for a double stuff Oreo. I mean, come on, who doesn’t love the cream. Riley has already learned that the stuffing in the middle is the best part and automatically opens it up and licks out the cream. She hasn’t quite conquered dunking her Oreos, but I’m sure that is to come. 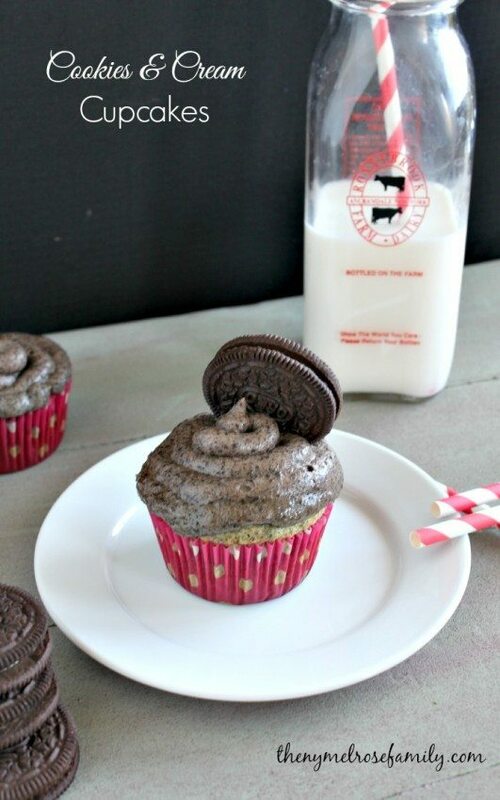 In order to make it so much easier for her to enjoy her Oreos, I created Cookies and Cream Cupcakes that are so easy to make. Your cupcakes look so delicious!! So glad you shared the recipe! These look wonderful! And, I totally agree with you about homemade icing! I don’t drink coffee though, so there’s no creamer in my house. I love love love cookies and cream flavored anything. Oreos don’t stand a chance in my house. These cupcakes never would either! Oh cookies and cream is my all time favourite flavour! These look wonderful!